The Lean Gahanna program has a mission to make government services in Gahanna simpler, faster, better and less costly. Using continuous improvement methods such as Lean and Six Sigma, Gahanna City programs and departments are empowered to cut the proverbial red tape, remove inefficiencies, improve customer service and achieve measurable results. By improving program efficiency and effectiveness through Lean training and projects, Gahanna government is a better value to the taxpayers and stakeholder communities. Over time, Gahanna will also be poised to provide services and training resources to other local public sector partners, such as the townships, schools and neighboring communities. Questions or comments can be directed to the Mayor’s Office at mayors.office@gahanna.gov. Think about the modern automobile assembly line. Every movement of materials, manpower and technology is tightly engineered, well thought out, and efficient. Everyone knows how their job relates to a quality product. There are quality control measures in place and the process generates very little waste. Now take a minute and think about your last interaction with a government agency. Whether you were renewing your driver’s license, applying for a building permit or paying your taxes. Was the experience similar? Tightly engineered, well thought out, efficient? Sadly, this isn’t always the case. But why shouldn’t it be? That’s where Lean Gahanna comes in. In the Lean Gahanna program, we use easy-to-learn private sector tools to visualize processes, identify waste and inefficiency, improve our operations and provide a better value to our customers. Currently more than 20% of the City’s current full-time staff have completed at least a week of training program in Lean and Six Sigma tools. This training provides staff with the hands-on experience needed to be able to apply these principles on the job. Gahanna is committed to growing this number, and doing so in a cost effective manner. In 2015 & 2016, most training took place using scholarships provided by the State of Ohio’s Local Government Efficiency Program. In 2017, we’ve begun providing the training in-house, at no cost to the City. Moving forward, we will be able to offer this training to our colleagues in neighboring governments and public organizations, like the townships and schools, as well. In order for this program to be successful, our employees have to feel comfortable with change. People can have a hard time separating their own self-worth from their work. We reinforce that when there is a problem with a process, the problem is not the person implementing the process–the problem is the process that they’ve inherited. Often we do our jobs the same way our predecessor taught us, or the “way things have always been done.” Our goal with Lean Gahanna is to build a culture where it is safe and appropriate to Question the Way Things Have Always Been Done Every Day. Streamlining our Accounts Payable process, shortening the amount of time it takes us to pay our vendors by up to three weeks and creating $45,000 in annual direct savings each year. Using available technology to reduce processing time in our Public Service department related to fleet and fuel purchasing by 300 man-hours per year. Overhauling our Recruitment process to reduce the time to fill full-time positions by more the 25%. We’ve made a lot of progress with the Lean Gahanna program, but we’re not done. As our environment, technology and customer needs change, we will continue to learn, build our Lean culture and tackle new projects. 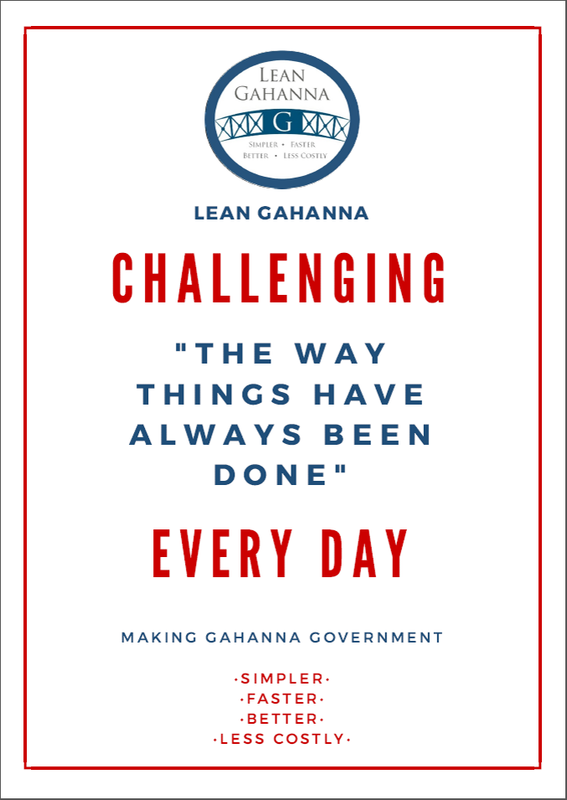 If you are interested in learning more about the Lean Gahanna program contact the Mayor’s Office at mayors.office@gahanna.gov.